Few things speak of the cycle of creation and destruction like the insertion of a beautiful bonbon into the alimentary canal. Like divine feats of gastronomical ingenuity, objects from our rituals, beautifully designed packages and even words upon which we have slaved and sweated, end up so often as detritus, heaped in landfills for later generations of archaeologists to ponder. Mishima Kimiyo, "Untitled," 2007, lent by Carol and Jeffrey Horvitz, photo: Richard Goodbody, courtesy of Joan B. Mirviss Ltd.
To help make this point and raise other questions with our viewers, I have selected works by three of the top conceptual artists in the field of contemporary Japanese ceramics, all on loan from Jeffrey and Carol Horvitz. In our contemporary ceramics case, located on the lobby level of the Pavilion for Japanese Art, I’ve placed a sculpture by Akiyama Yo with stacks of tea bowls crushed under the weight of compacted clay. One imagines this mangled stack to resemble the findings of archaeologists digging now in Kyoto, as they unearth the remains of seventeenth-century kilns. Hoshino Satoru’s work, by contrast, is a precious tea bowl, which a tea practitioner would carefully lift to inspect and remark upon before drinking from it during the course of a tea ceremony. If not for the good outcome from the kiln, Hoshino’s bowl might be found generations later in the same form depicted in Akiyama’s sculpture! Akiyama Yo (born 1953) and Hoshino Satoru (born 1945) are both members of Sodeisha (the “crawling through the mud” group), whose members in the 1950s first created ceramic sculpture in Japan. Both love to grapple with issues of creation and destruction, as well as peering beneath the surface to see what exists within. Akiyama does this by burning and tearing his potted clay, while Hoshino punches and pinches to find the quality of the material beyond the facade. 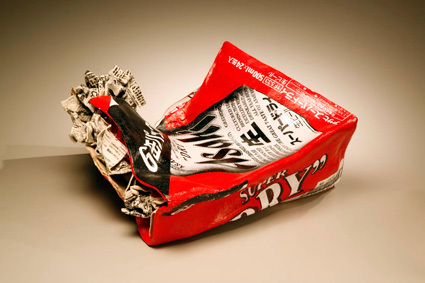 Apparently a woman of formidable strength, which I have to assume after trying to pick up her work, Mishima Kimiyo (born 1932) makes ceramic sculpture using silkscreen as a featured technique. She wishes to pry from her audience the understanding that our trash is filling the world, and if not dealt with soon, it will come to represent us to future generations. So, she presents trash from our food packages and newspapers as a potential contemporary icon. We were glad to see so many people in the Resnick Pavilion during our “flash visit” a couple weeks ago. Did you miss your chance? I know, it was short notice. But that’s how flash visits work. Speaking of: we’re doing it again! 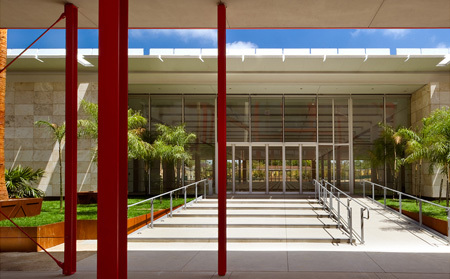 Since the last flash was such a success, we’re opening the Resnick Pavilion’s doors today and tomorrow. Once again you can get inside to see Walter De Maria’s The 2000 Sculpture. The pavilion will be open all day today and tomorrow, 12–8 pm, with your membership card or general admission. Don’t forget, the museum is free after 5 pm. With two exhibitions opening, three concerts, and a couple of special events, we thought it might be helpful to lay it all out for you so you might plan accordingly. Tonight the weekend kicks off with our weekly free Jazz at LACMA concert. Vocalist Janis Mann will take the stage at 6 pm. Don’t forget the museum is free after 5 pm, so you can sneak in some time in the galleries while you’re here. If you’re a member, you can also see John Baldessari: Pure Beauty—it’s open to members only, today and tomorrow. By the way, even if you’re not at the museum today, you ought to check in with our twitter account. Artist Adrienne Ferrari is taking over our feed all day for a performance as part of our Cell Phone Stories project. Saturday at 5 pm the salsa group Opa Opa will play a free concert in Hancock Park as part of our Latin Sounds series. Then, at 8 pm—after the galleries close to the public—we’re having our annual Late Night Art event, Video on the Loose: Freewaves and 20 Years of Media Arts. The nonprofit organization Freewaves has assembled more than twenty experimental videos which will be screened on the BP Grand Entrance all night. Tickets are just $10 and they get you into Pure Beauty too. Sunday Pure Beauty officially opens to the public. So if you didn’t see it as a member and you didn’t see it as part of Saturday’s event, this’ll be a good time too. Baldessari himself will join exhibition curator Leslie Jones in conversation at 2 pm inside BCAM. The event is free but you need a ticket, which will be available first-come, first-served at the Box Office one hour before the program starts. 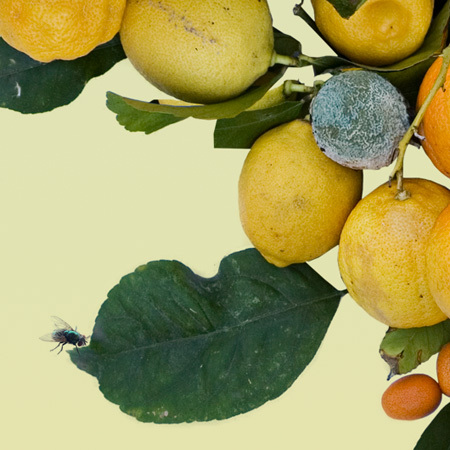 Also opening on Sunday is EATLACMA: The Fruit of LACMA, which was assembled by the artist collective Fallen Fruit. In addition to the exhibition in the Ahmanson Building, there are also a number of artist-created gardens all around campus. The artists will be on campus from 5–8 pm, enjoying an evening picnic in Hancock Park—BYOP (bring your own picnic). At 6 pm you can also drop into the Bing Theater for a performance of the USC/Thornton Polish Music Center’s Chopin Marathon. As with the other concerts this weekend, this one is free too! John Baldessari was on site this week supervising the installation of his retrospective, Pure Beauty, which includes works from the beginning of his career in the early 1960s to today. The show opens this Sunday to the general public and is open now if you’re a member. Here’s a short excerpt with Baldessari talking about Brain/Cloud and other work. Recently, we inaugurated a series called Community Stories, featuring interviews with Angelenos about their favorite works in our permanent collection. Top chef Susan Feniger chose a work by Helen Levitt from our photography collection—it may be viewed by appointment in our Wallis Annenberg Photography Study Room. 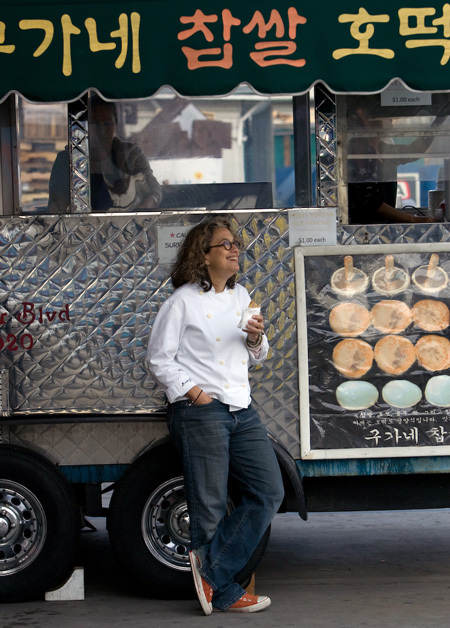 Feniger talked about why Levitt’s work appeals to her so much, and about the connection between art and cooking. This is the typical street corner, an afternoon in New York City. I really connect to that time period, and Helen Levitt does the most incredible job of capturing it. I think it’s the expressions on people’s faces and the emotions that her photographs show. 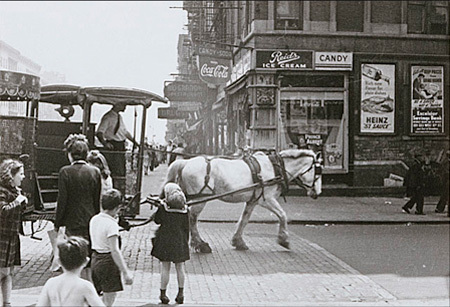 This is a totally classic Helen Levitt photograph. It really shows the feeling on the street in that period, and a lifestyle. Nothing fancy. It is about the relationship of these little kids and this street taxi, drawn by a horse. And you can see that it shows the grittiness and realness of the street. She’s got the Coca-Cola sign and this Heinz 57 Sauce sign and the Reid’s Ice Cream store. This is great for me because of all the food-related stuff! I’m aware of the street here, and the curb. She makes you very aware of where you’re standing. It’s not surprising that the chef whose most recent restaurant is called Street would be drawn to a photograph of a New York City corner. I love big cities. I’m just drawn to urban landscape. Everything starts from the street. That’s what so many people are inspired by—that’s what I’m inspired by. The art world, fashion, food. I’m drawn to the food someone eats on the street, or that they cook on the street. To me, that’s the most inspired food. 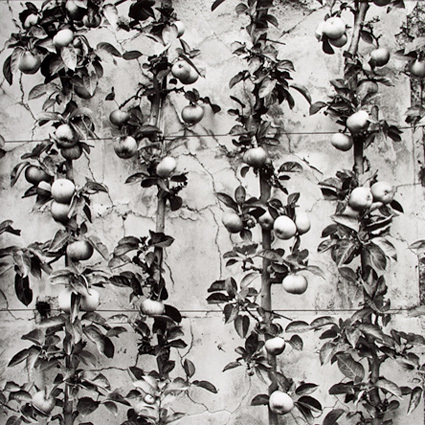 Feniger collects photography herself, and lives with two favorite works by Levitt. I asked her about what draws her to a picture. Pictures take me to a place inside. My life is so much about being out in public or in the kitchen, talking and talking! Helen Levitt’s stuff, it brings me inside. She captures the human soul. We also talked about how photography and cooking have a few things in common—a mix of creative intuition and technical skill, for example. There are a lot of technical parts of cooking that aren’t critical but important. I worked in a fish market for a year, just learning how to fillet fish. I think that’s what an artist does, constantly remaking something, improving it. I taste something and I think, “I’ve never tasted anything like that!” or I think, “That’s a great idea and I think we could do it better.” I can taste a dish, tweak it, and make it stronger. I don’t think anyone tastes enough. They’re busy. But I find myself tasting and tasting. Does it have enough acid? Enough salt? Enough strong flavors? Is it good but not fantastic? You have to make it, taste it, remake it, and do that every day. It can always get better. I think we can open people’s hearts and their minds to be more open about other cultures through art, or food. Food and art are great ways to equalize people. 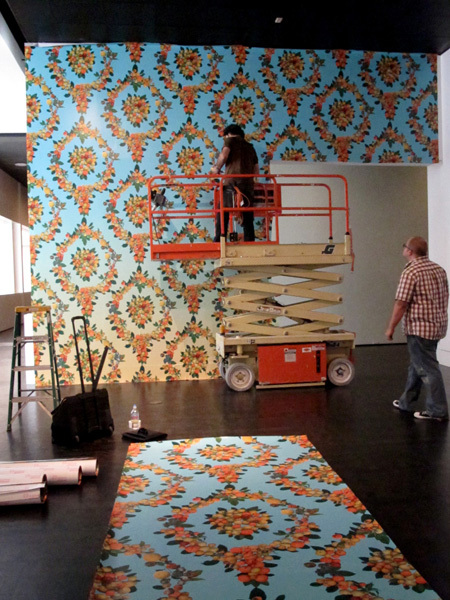 Last week I spent two days in the gallery watching the installation of the Fallen Fruit “wallpaper” for the upcoming exhibition EATLACMA, opening this weekend. 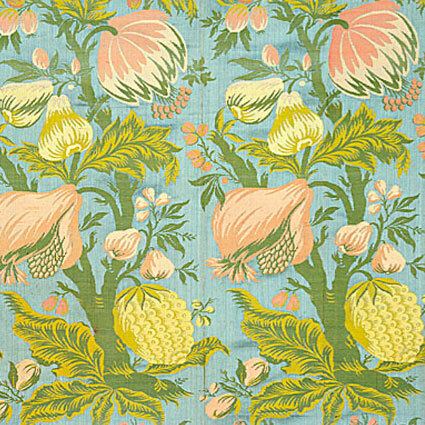 While going through our permanent collection picking out pieces for the show, the artists of Fallen Fruit came across two works which they used as inspiration for their wallpaper design. I asked Austin Young, one of the members of Fallen Fruit, about their ideas behind the wallpaper. He explained that the design is made from public fruit that they gathered around Silverlake, while the background resembles the colors of a California sunset. Young also told me the original idea was to use all rotted fruit for the pattern. Though they veered away from the concept, they still managed to put a few rotted pieces in there. Pieces that Young rotted in his own yard! 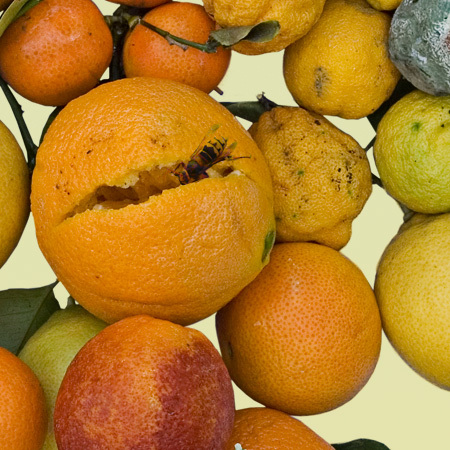 There are also other little things to find, like a fly, a bee coming out of one of the oranges, or little fruit flies (all actual size). With Wimbledon starting today, I’m in the mood for tennis. But I’m glad I don’t have to play it in this. While this dress in LACMA’s Costume and Textiles collection may not look like tennis gear, it’s what would have been worn by the first female competitors at Wimbledon. Lawn tennis was invented in 1873 and quickly became wildly popular throughout England. The first Wimbledon tournament was played in 1877, though women did not compete until 1884. Tennis was enjoyed primarily by the upper classes, and it was one of the few sports that men and women played together. As a result, female players were expected to dress attractively and fashionably as well as comfortably. It was not unusual to see high collars, long sleeves, corsets, gloves, high heels, and even bustles on the tennis court. While following the fashionable bustled silhouette of the mid-1880s, this dress makes a few small concessions to the physical rigors of the game. It is made of lightweight, washable cotton, with a shortened skirt and a deep pocket for holding balls. Instead of a bulky undergarment, the bustle is created by built-in hoops with interior ties to adjust the volume. These innovations distinguish it from everyday fashion. In dress as well as behavior, tennis changed the rules for women off the court. In 1885, the magazine The Field observed: “Lawn tennis has taught women how much they are capable of doing and it is a sign of the times that various game and sports which would have been tabooed a few years ago as ‘unladylike’ are actually encouraged at various girls’ schools.” Elements of sportswear—like shorter skirts and pockets—found their way into streetwear, while bustles disappeared, hopefully forever. Over the years, tennis has continued to launch fashion trends, from Suzanne Lenglen’s headbands to the daring black lace and neon yellow ensembles designed and worn by five-time Wimbledon Ladies’ Singles champ Venus Williams. You can see this dress on display in the Resnick Pavilion beginning October 2 as part of the exhibition Fashioning Fashion: European Dress in Detail, 1700–1915. You are currently browsing the Unframed The LACMA Blog blog archives for June, 2010.